Thoughts from a man of God, husband, father, Pastor, and friend. When I was younger my parents bought my brother and I a record player to play our children's stories and songs. We had one record which was a dramatization of the Popeye cartoon. 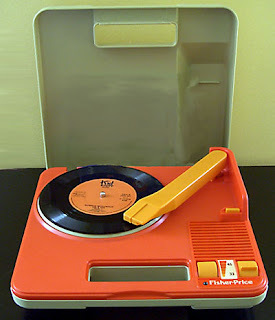 The only thing I can remember from the story are these words, "Oil and Blubber..Oil and Blubber..Oil and Blubber.." There was a scratch on the record and whenever the needle would get to that point it would always get stuck until we bumped the record player or picked up the needle. This nagging repetition that happens with a scratched record reminds me of the term called murmuring. As you continue our 30 day Negativity Fast and Gratitude Feast I hope you are becoming aware of times you find your self murmuring and learn how to give yourself a bump. According to Strong's Concordance the word murmur is translated in the bible to mean: to stop (usually over night); by implication to stay permanently; hence (in a bad sense) to be obstinate (especially in words, to complain): - abide (all night), continue, dwell, endure, grudge, be left, lie all night, (cause to) lodge (all night, in, -ing, this night), (make to) murmur, remain, tarry (all night, that night). Murmuring is a spot that you get stuck on and dwell for a long period of time with no resolution. Here are five ways to give your self a "bump" when you are stuck in a rut of murmuring. I have had to catch my self several times on this Negativity fast and intentionally choose gratitude. I don't want to be known for what I complained about but for what I did to fix the situation. Choosing to fast from murmuring will change your life! Keep going on this journey and invite your friends. Listen to a message I shared on the subject called "The right way to Complain"
-Read about 5 Observations on Choosing a Joyful Perspective. -Join in as we fast from negative words for 30 days. I wrote 15 viable reasons to join this campaign in a previous post. Don't forget to check your email to verify subscription.